On Thursday, August 30, 2018, a third hemp training event will be held for law enforcement in Kinston, NC. 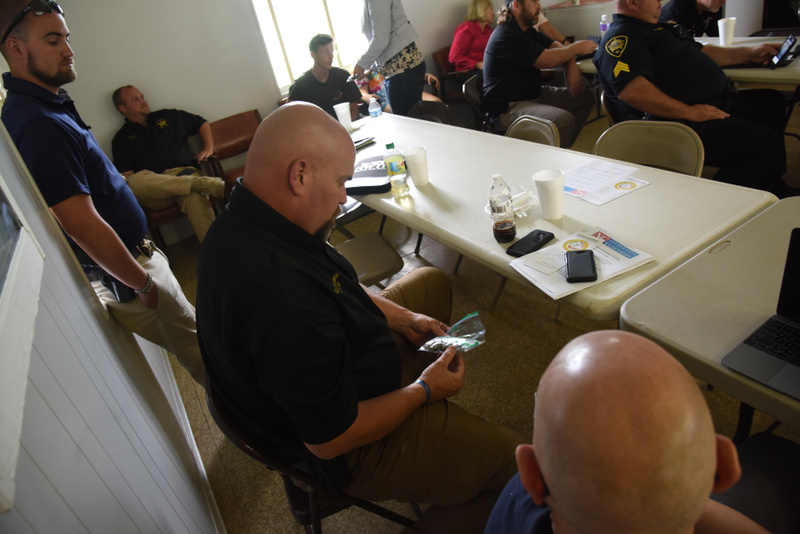 Two previous Law Enforcement Hemp Training opportunities were held across the state to provide information and resources to members of law enforcement and their staff in June. This event is only open to law enforcement and their staff, but we are encouraging licensees and the NC hemp industry to notify their local law enforcement offices about this third training. Working together with law enforcement is vital for the program’s continued success. Law enforcement inspects a hemp sample during a training event in Salisbury, NC in June. Speakers and presenters will include Industrial Hemp Commissioners, compliance personnel from the N.C. Department of Agriculture & Consumer Services (NCDA&CS) and NC State University researchers. Lunch will be provided and an optional tour of a local hemp farm will take place after the training event. For information about this training and for the link to register for the event, please email the program at IndustrialHemp@NCSU.edu.